In 1954 AGI launched the Agiflex III, which, cosmetically at least, was clearly inspired by the Meister Korelle. 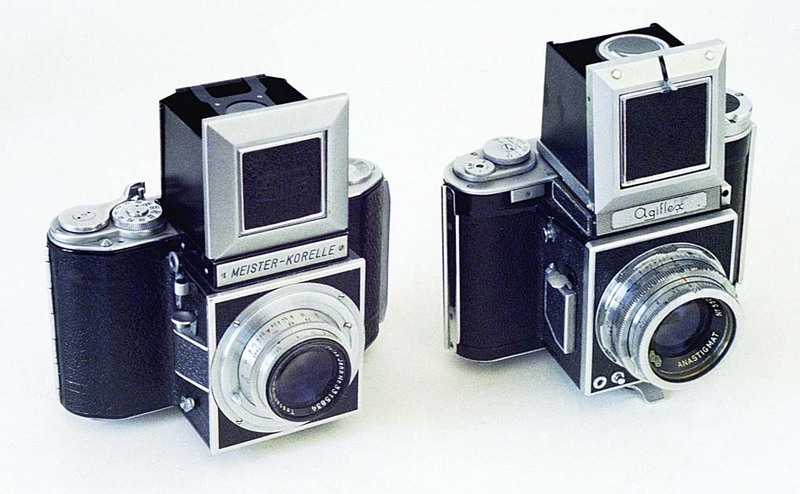 The similarities between the Meister-Korelle, on the left, and the Agiflex III are immediately obvious. The Agiflex III had a new Agilux Anastigmatic 80mm f/2.8 lens, still with no automatic-aperture operation, and the same three-claw bayonet mount as the earlier Agiflex II. The mirror was now raised by the shutter release mechanism and so was no longer instant return. 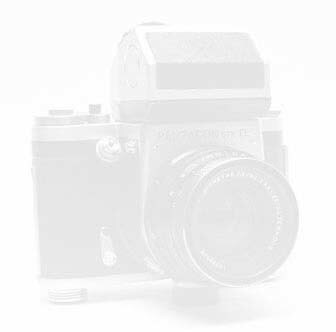 There were two coaxial flash sockets, one with FP and the other with X synchronisation, hidden behind a spring-loaded door on the lens box of the body. The waist-level finder with magnifier and sports finder was removable, to enable it to be replaced with a pentaprism. However, this extremely rare item appears to have never entered serial production. 160mm, 240mm and 300mm lenses, all with a maximum aperture of f/5.5, were also now available. No wide-angle lenses were ever available for the Agiflex cameras. As can be appreciated from the above photo, Agi had still not managed to get all the shutter speeds onto a single speed dial, so there was a separate dial for the slow speeds, as in the Agiflex I and II, and indeed as in the Reflex Korelle of 16 years before, and the top speed remained (nominally!) 1/500. Likewise, the lever wind was still on the left of the top plate of the camera. 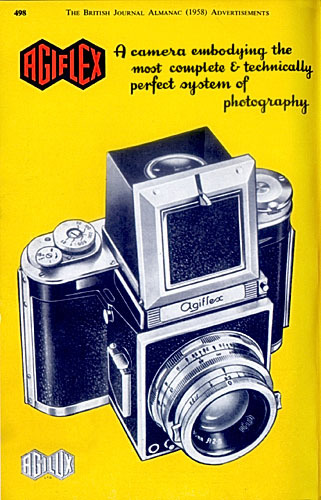 Sales of the Agiflex continued until the 1960’s, when the UK government removed import restrictions on foreign cameras, and production ceased in the face of German and Japanese competition. To go to the Bibliography, click here. To go on to the next section, click below. To go to the beginning of the history section, click here.